Okay, so it’s winter and you live or planning a trip to New York. It’s one of the coldest cities in US. You already know what you need to wear to beat the cold weather – a layer of warmth and comfort. And obviously, you’re aware that what you decide on wearing could look tedious and unoriginal, like that ratty sweater (with tiny holes) you’ve been wearing for years, you’re oversized parka which appears to belong to your granddad’s granddad. The thing is, just because it’s cold, you’re going to leave the house looking like a walking duvet. It’s absolutely freezing outside and you can’t be bothered with looking presentable, I know. 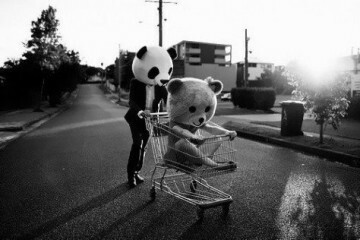 But don’t you think it’s time you man up on fashion risks (you were afraid of wearing) when you know everybody else is shrugging off what they’ll look for the day while carrying a cup of venti Starbucks black coffee – strong – in their hands and being either depressed or grumpy because of the weather? There are a lot of ways to keep you warm during winter in The Big City without seeming like just a guy with the rest of the crowd. Here are a couple of tips on what you should be wearing without looking like a plain, old, dull person. Here’s a look perfect for a walk around the cold, big city – wool blend coat, dark jeans and a classic wingtip boots. Add gray accessories like gray scarf and gloves so it would be extra warm for you. 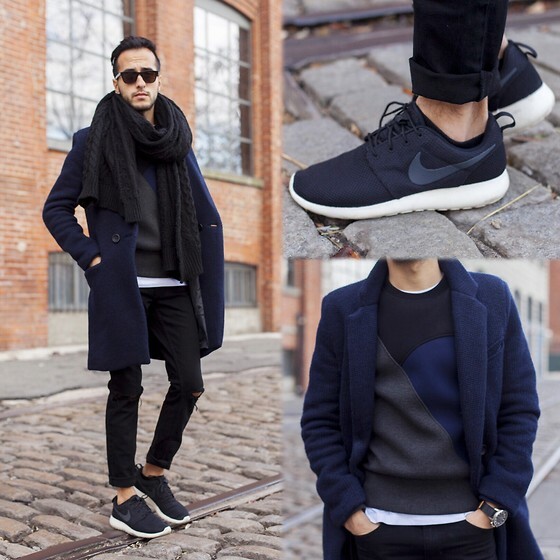 For a classy, modern look, go for a three-toned sweater, a navy coat, and your favorite skinny jeans and finish it off with some Nike Roshe. Choose pieces that match each other for a fab casual yet clean combination. When the cold is bearable in New York, try choosing a slim-fit striped shirt and pair it off with a peacoat and navy blue trousers. Complete the look with white sneakers and a cap. It’s a simple look for a morning to afternoon errands. 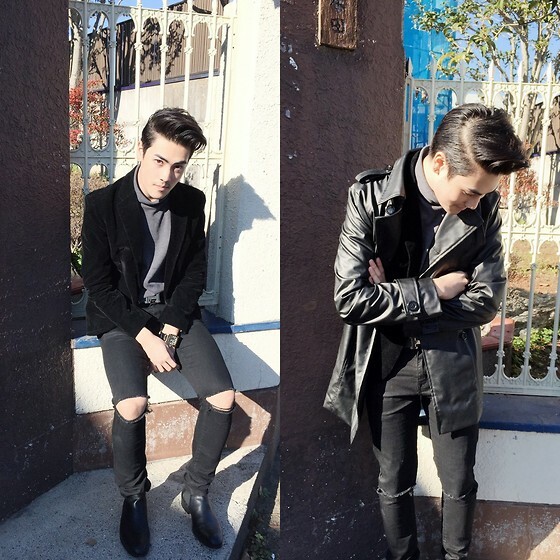 Keep yourself cozy yet fashionable with layers – double breasted leather coat, velvet black blazer and grey turtleneck shirt. For that rock star vibe, opt for some ripped-knee skinny jeans and those classic leather boots that every man must have in their wardrobe. Add accessories like a statement belt and a vintage watch to complete your look. 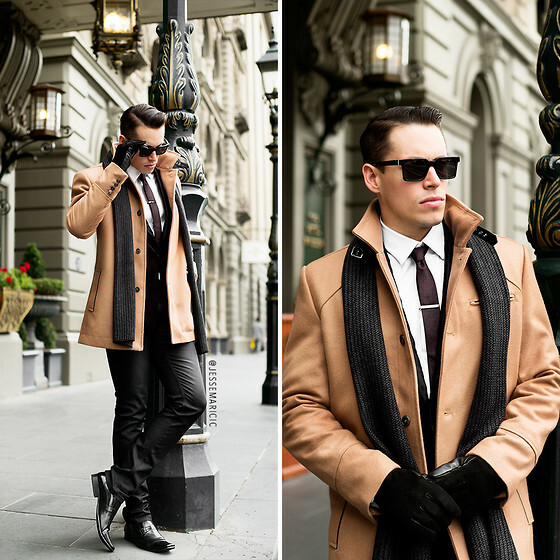 One trend that is currently taking over both men’s and women’s closet this season is a camel coat. It is such a key trend this season that everyone actually own one. It’s very versatile; you can wear it with just about anything. For a modern street wear on this trendy coat, pair it with jeans and sneakers. While if you’re going to work that day, mix it with a blazer, a round-neck shirt and a shirt. 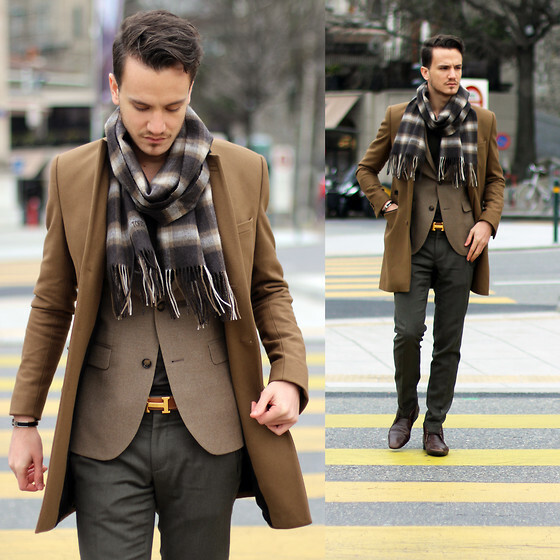 Go for a camel coat that has a slim-fit cut and is made in cashmere. For a bad boy look, pair your denim jeans with a purity ankle boots and a motorcycle leather jacket with fleece collar. Complete the ensemble with a black beanie and sunglasses. Be sizzling hot for the cold winter days with this effortless ensemble. New York, these days, is a sea of black coats. 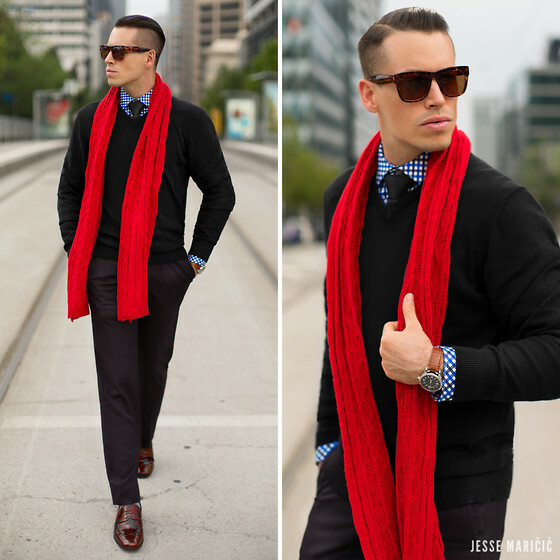 You need to stand up and incorporate a bit of color into your look. Try this ox blood top coat paired with a button down shirt, wool pants and white trainers. How comfortable-looking is this look? 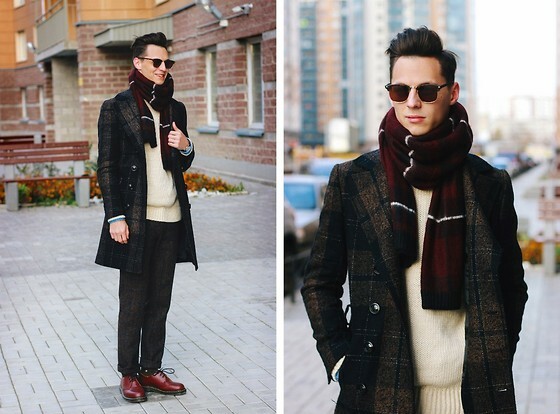 A tartan coat, knit sweater, wool pants and a scarf, paired with some popular Dr. Martens dress shoes. 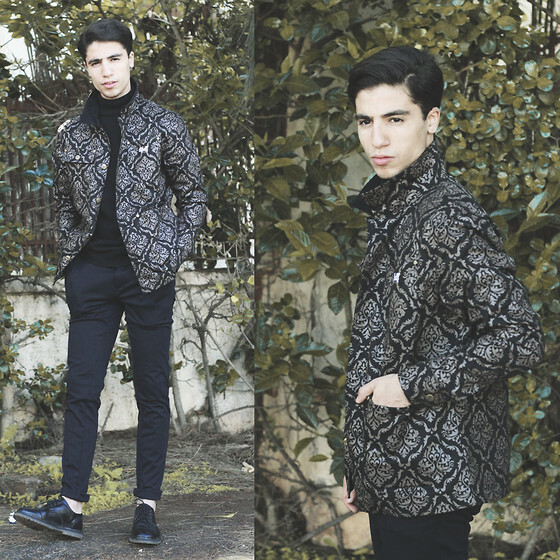 A statement jacket could instantly upgrade your boring winter look, making it more presentable and fashionable. Play with textures, styling and color palettes. 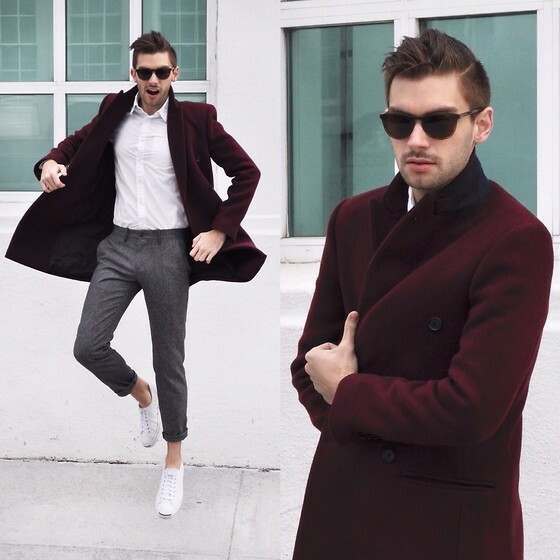 Add a tan coat over a burgundy velvet blazer under it and some black jeans to achieve a semi-formal yet casual appeal. 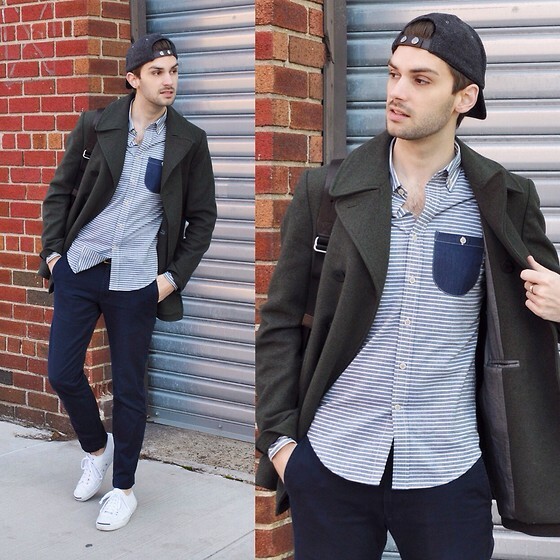 Here’s a city classic look with an added pop of color. 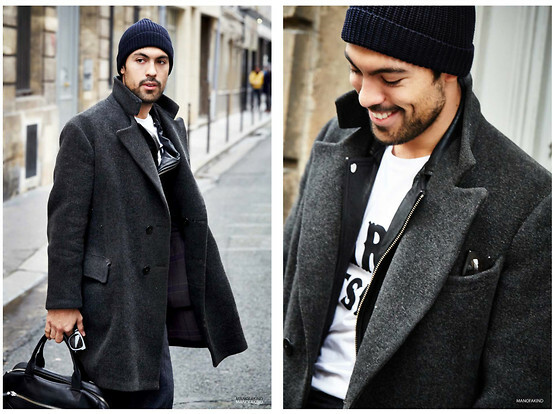 At some point, you need a perfect, oversized, extremely soft winter coat in your wardrobe. Combine it with gray-palette accessories, a slogan shirt and to perfect a figure-fitting rock-n-roll edgy type of look, pair it with black brogues. Complete your layers with a scarf and don’t forget a headwear to keep yourself extra warm.